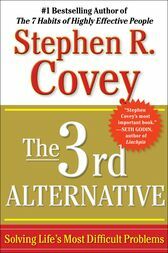 From the multimillion-copy bestselling author of The 7 Habits of Highly Effective People—hailed as the #1 Most Influential Business Book of the Twentieth Century—The 3rd Alternative turns Dr. Stephen R. Covey’s formidable insight to a powerful new way to resolve professional and personal difficulties and create solutions to great challenges in organizations and society. There are many methods of “conflict resolution,” but most involve compromise, a low-level accommodation that stops the fight without breaking through to amazing new results. The 3rd Alternative introduces a breakthrough approach to conflict resolution and creative problem solving, transcending traditional solutions to conflict by forging a path toward a third option, a 3rd Alternative that moves beyond your way or my way to a higher and better way—one that allows both parties to emerge from debate or even heated conflict in a far better place than either had envisioned. With the 3rd Alternative, nobody has to give up anything, and everyone wins.